Update: On September 17, the U.S. Senate passed the Opioid Crisis Response Act by a vote of 99-1, following approval of a separate comprehensive opioid bill in the U.S. House of Representatives in June. The two chambers’ bills contain substantive policy differences around Medicaid treatment options, patient privacy laws and reauthorizations of federal health and public safety programs. The House and Senate must resolve these outstanding items before voting on a final version of the legislation. Congressional leadership hopes to finalize a legislative package in the next two weeks, with the aim of sending a bill to the president’s desk before the midterm elections in November. As communities across the U.S. struggle to address the opioid epidemic, the U.S. House of Representatives and U.S. Senate are finalizing comprehensive opioid legislative packages that are designed to strengthen the nation’s response to the crisis. In the U.S. House of Representatives, legislators passed the SUPPORT for Patients and Communities Act (H.R. 6) in June, a sweeping 460-page bill combining dozens of narrowly-focused measures introduced by members over the past year. 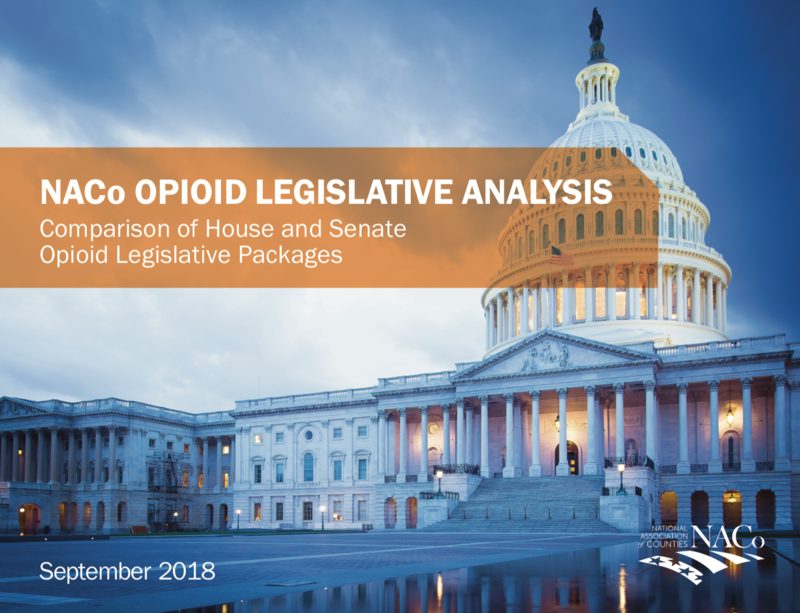 Across the Capitol, senators are finalizing negotiations on the Opioid Crisis Response Act (S. 2680) – a separate comprehensive measure that contains both differences and areas of overlap with the House bill. The chamber is expected to vote on its package before the close of the 115th Congress. Once both chambers have approved legislation, the two must then reconcile any differences between the bills before voting on a final version and sending it to the president’s desk for a final signature. To help county officials understand this legislation, NACo has created a legislative analysis of the two bills, outlining major provisions that could impact counties if enacted. The chart details whether each provision is included in the House bill, the Senate bill, or both, as well as how local governments could be affected by the proposed measures. This analysis is part of NACo’s ongoing advocacy to help strengthen federal support for county agencies on the frontlines of our nation’s response to the opioid epidemic. NACo will continue to engage with House and Senate legislators to ensure county priorities for prevention, treatment and recovery are included in any final opioid legislative package. If you have questions about the content of this report, please contact Valerie Brankovic, NACo Legislative Assistant, at vbrankovic@naco.org. Stay up to date on the various proposals under consideration.